Jabal Omar Project is one of the developmental and residential projects implemented nowadays at Mecca City. The project is located on Jabal Omar in the west of the Holy Haram with an area of 230 square km and construction area of 200 square km. Ibrahim Al Khalil Street borders the location from the east, turning left to become Umm Al Qura Street, moving towards Al Hafayer in the west and Dahl Et Al Rushd in the south. 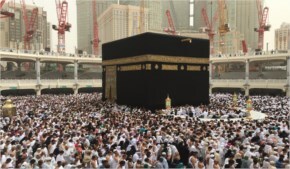 The project aims at providing accommodation in hotels as well as residential buildings, trade areas, car parkings, public places and facilities to reinforce the religious, social, and trading activities of Hajj and Umrah during Hajj season and Ramadan and other occasions annually. The project is to be divided into five phases including 26 hotels distributed on 38 towers, operated by international companies, for instance, Hilton, Sheraton, Hyatt Regency, Marriot, Softwill, Westin, Radisson, Holiday Inn, and Crowne Plaza. Regarding mosques in hotels, they consist of 6 covered and air conditioned floors with capacity of 65.000 prayers, and linked with King Abdulaziz Road from the second floor level and with the Holy Haram west domain from the ground floor. The floors are connected with one another by stairs, escalators, and elevators to ease the movement back and forth. In additions, there are mosques existing in the residential towers and location specified for prayers in public and open spaces. The project includes modern malls and markets; among the most significant are multi floors markets with view over Ibrahim Al Khalil and Umm Al Qura Streets, as well as series of markets for walkers on both sides of King Abdulaziz Road ending with the Central Market in the north side of the project. The area of these markets is 163.500 square meter. 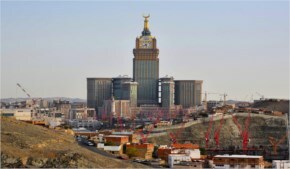 Lastly, the project also contains conference center or more accurately a hotel for conferences which is a hotel tower connecting with a hall and main center for conferences with live view over the Holy Haram. The main hall capacity is 3000 people.